This is how Qur'anic Arabic is taught, and it get's even more complicated, much more complicated. But does it really have to be that way for someone who just want's to know enough to be able to understand what they are reading? 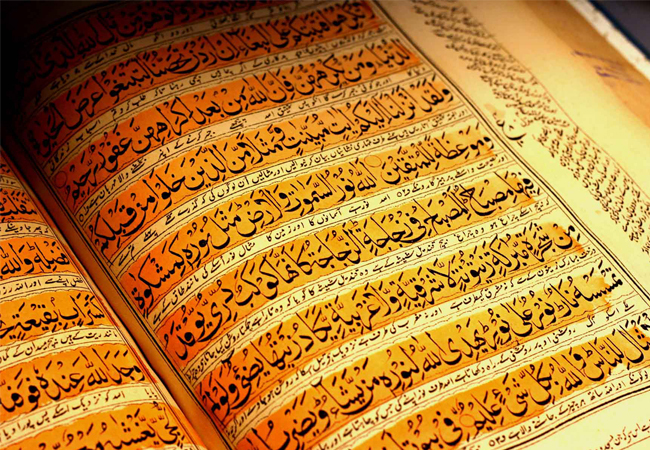 You haven't experienced the power of the Qur'an​ until you've experienced it in Arabic. ​Take a look at the video below. Have you ever asked yourself what is it that makes grown men cry in public like this? If you're bilingual you'll know how difficult it is to convey the emotion in one language to another, when it comes to poetry, proverbs and even songs. How can we do this with the Words of Allah? If so read on.... you could be experiencing it in just a few short weeks. The truth is we never learn languages by learning every aspect of the grammar rules first. I'm pretty sure you could not even analyse and dissect English like that. For the average person who simply want's to understand the Qur'an at a basic level being too grammar heavy is one problem but we have another that manifests itself, in Universities, schools and colleges up and down the country. In these places most students barely learn any of the grammar instead they are taught to memorise sentences and phrases without really having any understanding of the structure of the language. ​The trouble with this is, they are just able to parrot responses to what they have been conditioned to recognise often making a lot of errors. 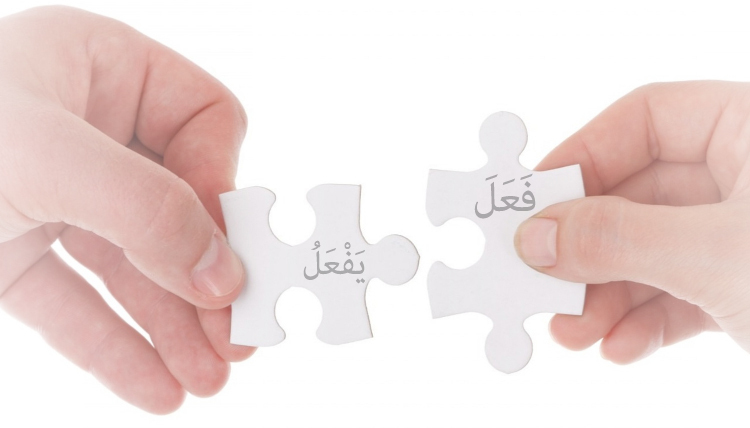 So we need a balance of learning the essential Arabic grammar without making it overwhelming as well as vocabulary. Wouldn't it be better if it was vocabulary directly related to the Qur'an instead of irrelevant things like 'A new bike'. ​Learning random things in a new language is great and all but seriously who has the time? What would be even better is if you could learn anywhere, anytime with flexible video lessons and still get the support of a teacher when you needed right? 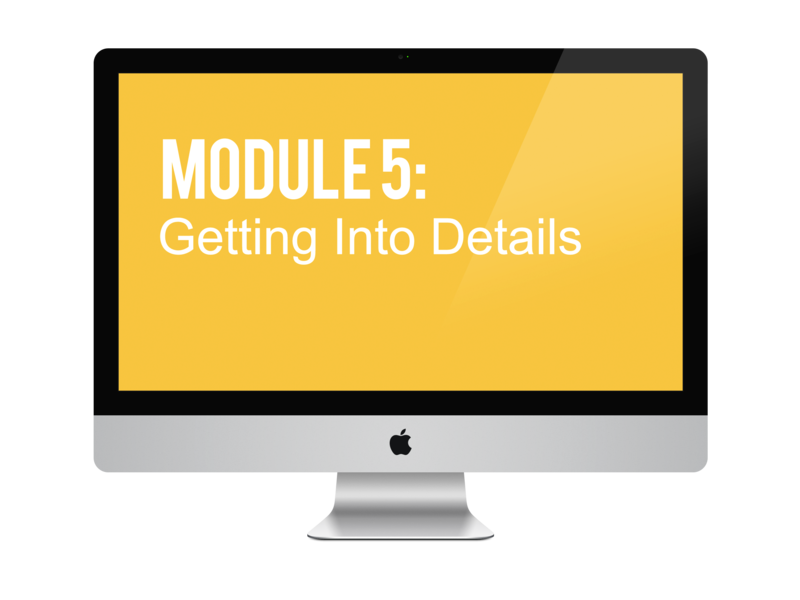 The course is made up of short clips ranging from 3 to 7 minutes to keep you focused, giving you just the right amount of detail you need. 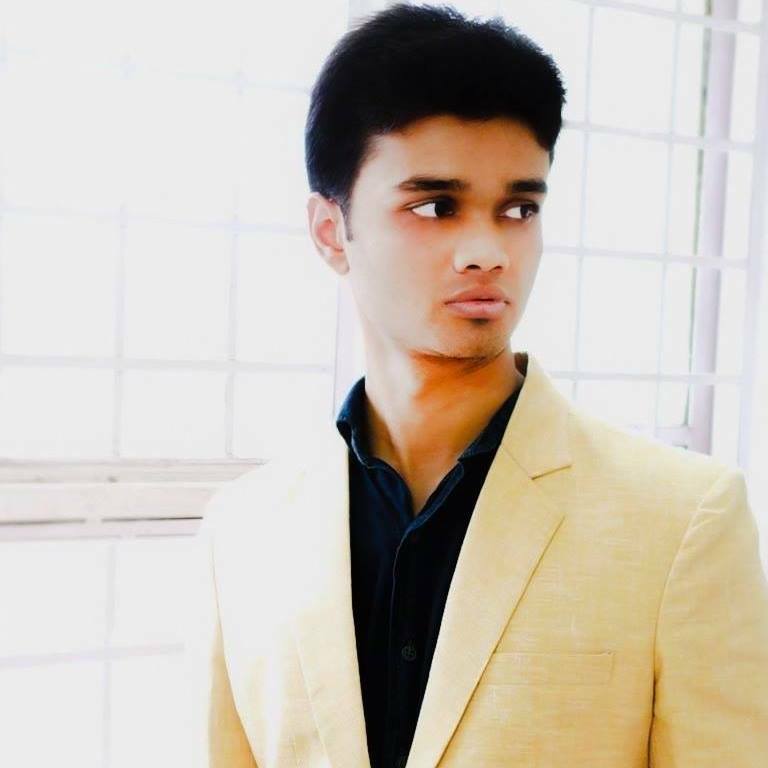 "I have been wanting to learn Quranic Arabic for ages but always found it to be a daunting task. Until I met Adam. 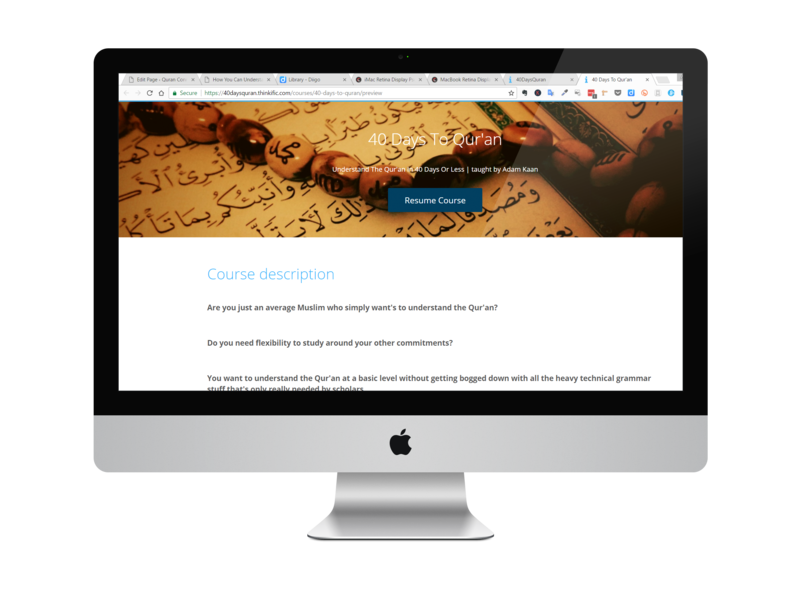 His course is designed to give you small victories and never becomes overwhelming while at the same time it will equip you with all the tools needed to truly understand and appreciate the beauty that is Arabic Quran. Highly recommended for anyone who wishes to understand and be guided by the words of Allah directly.."
"Increase you knowledge of the Qur'an with every lesson." Unlike some other courses where you have to wait months before seeing the relevance of what you're learning. This course is structured in such a way that you will see the results of your new found knowledge and apply it to the Qur'an straight away. Imagine if you read this verses after Fajr salah and you understood and reflected on it, as we are encouraged to do so by Allah. How would that influence your behaviour that day? The other day I heard someone said some negative things about me which I was very annoyed over. I was planning on confronting the person about it, but whilst reading the Qur’an I was reminded of the verse above, so I didn't pursue it. Another time, I was in a restaurant where the waiter was very rude, I was about to give him a piece of my mind and the verse​ above came to mind so I politely smiled and overlooked it. These are just two examples, incidents like this happen all the time, where my daily recital influences my behaviour that day. This would have never happened if I did not understand it. Even when I was memorising Qur’an and reading and a whole para in the morning it wasn’t influencing how I behaved. Not only will you find it easier to memorise the Qur’an it will Inspire you to read more and memorise more. I’m not a hafiz but I’m often asked if I am, simply because I can remember passages of the Qur’an from listening to them. Imagine how easy is it to remember a conversation or a story. The Qur’an is replete with stories that are lessons for us, from the lives of the prophets and from seerah of our Prophet. Timeless conversations and ayahs full of wisdom. Once you are able to understand them and become familiar with them, it will assist you in memorisation, as they start to shape your life. Think about how many motivational and inspirational quotes you can remember off social media now imagine yourself reading passages even more powerful than those every morning and remembering them direct from Allah. How will that affect your mindset and influence your behaviour? Your morning recital will be your daily programming. You’re going to the source. How would it affect you? How would it change your life? Imagine your subconscious being massaged with the words of Allah during all these times. After finishing this course each time you read the Qur’an it will condition your mindset. Ask any success guru they’ll tell you the value of daily affirmations. What can be greater than the words of Allah to condition you thought patterns?! If you understand the Qur'an reflect on it and apply it I GUARANTEE it will be your catalyst to greatness. Learn how nouns are formed from verbs. As soon as you understand this concept it will be a, Oh Wow! 'light bulb' moment. You'll will be surprised to find, all of a sudden you can understand a lot more. Now you know the meaning of words that you already knew. You will wonder why you had not learnt to understand the Qur’an earlier. I'm currently offering the course for £97 as a promotional offer, that’s a £200 saving off the normal price of £297. Jump on at the discounted rate whilst you can. Get Instant Access to 40 Days To The Qur'an! click the button below to get instant access to a FREE Trial! It’s been made to seem that way because of all the technical jargon used by some teachers. You see the problem is most course are designed for scholars who have to learn it that way because well... they’re scholars. We’re not trying to make you a scholar and you’re not going to give fatwah’s based on your understanding (well at least I hope not). It is true as you understand the intricacies and deeper nuances it becomes fascinating but it’s not necessary at this stage. Upon completion of this course it is very likely that you will want to study the Qur’an deeper and I would highly encourage you to do so but you don’t have to. A surface understanding is better than no understanding. Inside you’ll find cheat sheets, bonuses and language hacks with more coming that will make it really easy. This will shave off hours and even days from your learning. I’ve got plenty of other ideas that are coming for making it fun and enjoyable for you. 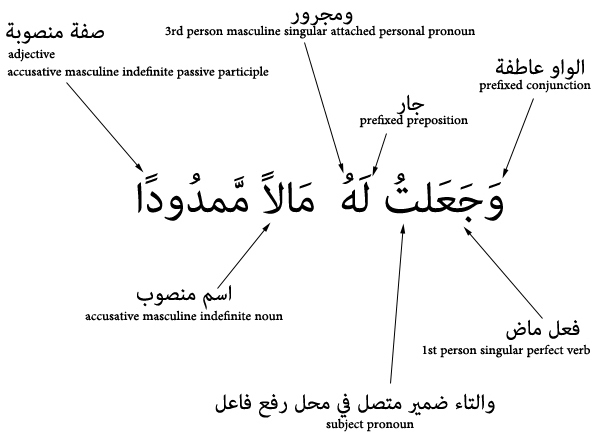 A lot of Arabic vocabulary is based on patterns once you start to become familiar with these patterns it becomes quite easy. As long as you have know some basic essentials you really don’t need to become an expert in the technical grammatical stuff to understand the Qur’an. You can always learn that later like I did. Let’s face it if you don’t make the decision now, you probably never will. How long are you going to go missing out on the treasures the Qur’an has to offer? Remember this is the book for which even disbelievers sacrificed their sleep to get up and listen to at night. They had no words for it except ‘Magic’. How long will you wait to experience the magic of the Qur’an?. "﻿With ﻿﻿40 Days to the Qur’an﻿﻿ you’ll learn to understand the ﻿﻿﻿BULK﻿﻿﻿ of the Qur’an in approximately 40 Hours. MORE IMPORTANTLY you will get ﻿﻿ALL THE TOOL﻿﻿’s you will need for a lifelong self study of the Qur’an. I assure you it will be a fascinating journey. " Not for anyone who is not willing to put in the time effort. You will need to put a side a few hours a week to an hour a day depending on how quickly you want to understand the Qur'an. This course takes approximately 40 to 60 hours to complete. Upon completion you will have all the tools you need for further study. As with anything else, anything worth having requires time and effort. You will not instantly be able to understand the Qur'an just by purchasing the course and doing nothing with it. I'm here to help and support you as much as I can but you will need to do the work. The aim of this course is to show you that it can be easier than you imagined. With a little effort in the right way you you can achieve a lot. Will I be able to speak Arabic? Even though this course will give you a strong foundation to build on. Much stronger than some Modern Standard Arabic courses, yet you will not be able to speak Arabic at end of this course, for that a different approach is required. I'm aiming for a surface level understanding equivalent to reading a translation. 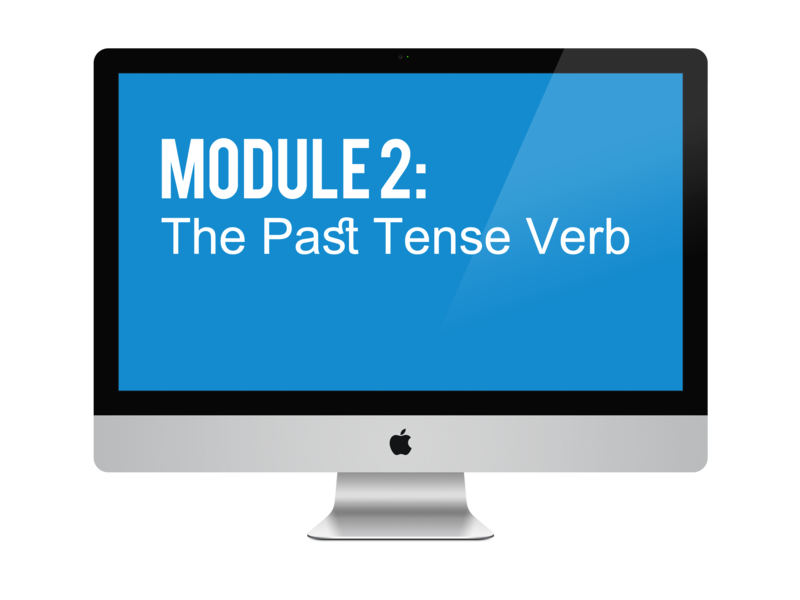 Taking a frequency approach with grammar morphology. Although you would cover the most frequent vocabulary during the lessons. You would need to continue self study to learn new vocabulary. You will be shown a few easy ways of doing this. Most ayahs and bulk of the Qur'an you'll be able to understand from a handful of the frequent words that are very repetititve in the Qur'an. The aim is to provide a foundation and springboard for further study. Whilst overcoming the idea that one needs to engrossed in complicated lengthy courses that drag one for years to get a basic understanding of the Qur'an. The Qur'an is our life long companion and I hope to get people in a habit of studying it regularly and acquiring the meanings of one of two words in the process. Its not designed to be in depth study of the Qur'an I hope that helps. Although this course will help you improve your reading fluency through site recognition. You should be able to read the Arabic text of the Qur'an. Shouldn’t Qur’an Courses Be FREE? I'm glad you asked :-). I’ve thought long and hard about this issue, and for many years For many years I offered tuition for free and what I learnt is no one values free. Free is seen as cheap, and worthless. Even the few people that do take you up on the offer never see it through because it’s free. My end goal is for people to understand the Qur’an. I want them to commit and take it seriously and numerous studies have shown most people only do this if they have paid for something. It separates the wheat from the chaff, the serious folk from the tyre kickers. 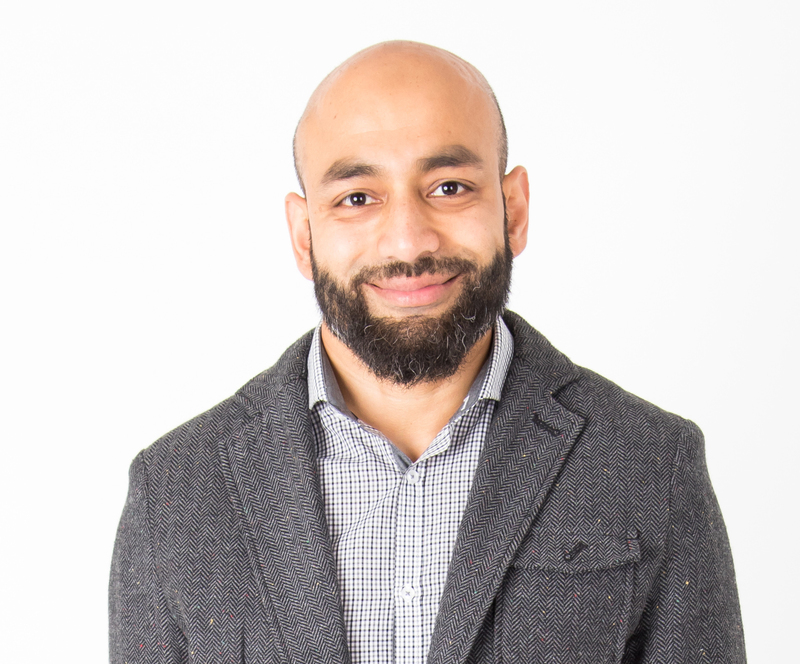 The other thing I learnt from having worked with a so many Muslim organisations and charities is they can’t grow and improve their offerings because they don’t have a revenue stream. During my teenage years I attended Bolton Darul Uloom, where I began my Qur’an studies. I experienced some of the problems I’ve mentioned above there. Later on in my early twenties I learnt to understand the Qur’an in a very short space of time. I’ve always had a love and passion for the Qur’an. Ever since I’ve understood it I have always wanted everyone to be able understand it. At least at a basic level. I have been teaching Arabic at a Muslim Boys Secondary school the past few years. Prior to that I have taught at a Masjid. I have been engaged in teaching Qur’an in one form or another since my teenage years. I don’t claim to be a scholar or a commentator of the Qur’an I simply want to convey as much as I know which is sufficient for most muslims who want to understand enough Qur'an to be able to make sense of what they are reading. Teaching is also the best form of learning.